Regulated Capitalism Beats Marxism...just look at this picture! Marxism is a miserable failure, as proven by the appalling conditions that people in N. Korea and Cuba live under every day. Regulated capitalism, while not perfect, is clearly a better alternative. 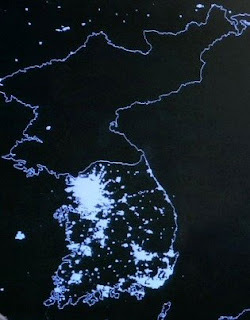 This picture is a night-time satellite photo of North and South Korea....truly incredible, when you think about it. The North can't provide lights for their own people at night. They also can't even FEED their people, as this article from Amnesty International shows:"For more than a decade, the people of North Korea have suffered from famine. Hundreds of thousands of people have died as a result of acute food shortages caused by natural disasters and economic mismanagement." What ideas do YOU have to help these people overcome their tyrannical dictators?